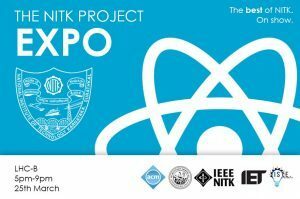 We, the Exclusive Technical clubs of NITK present to you, for the first time in NITK, our Annual Project Expo. Multiple projects covering all strata of science, engineering and business will be on display by Executive Members from NITK Student Chapters of IEEE, ISTE, ACM, IE and IET. We hope to see you there and ensure you make most of the experience.